How to find the perfect glasses for you! So many of my patients have a hard time finding glasses. So, here are a few tips on how to find a pair that you will LOVE! First, figure out what face shape you have. 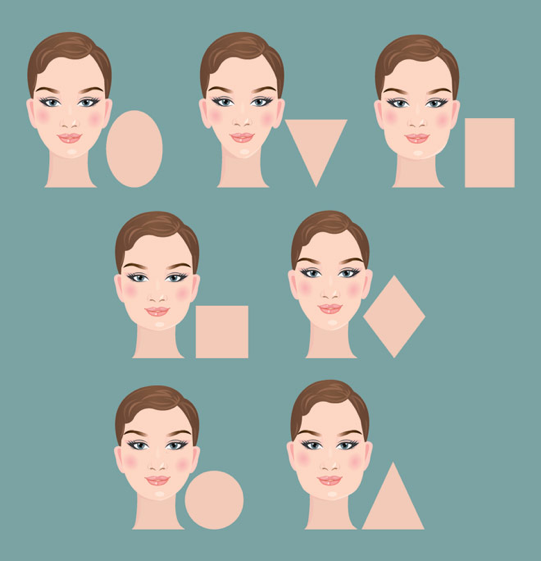 There are seven basic face shapes. I always say you should be able to find one of these that are close to your face shape. An oval face is considered to be the ideal shape because of its balanced proportions. To keep the oval’s natural balance, look for eyeglass frames that are as wide as (or wider than) the broadest part of the face, or walnut-shaped frames that are not too deep or too narrow. This face has a very wide top third and small bottom third. To minimize the width of the top of the face, try frames that are wider at the bottom, very light colors and materials and rimless frame styles (which have a light, airy effect because the lenses are simply held in place by a few screws, with no surrounding frame material). An oblong face is longer than it is wide and has a long straight cheek line and sometimes a longish nose. To make an oblong face appear shorter and more balanced, try frames that have more depth than width, decorative or contrasting temples that add width to the face, or a low bridge to shorten the nose. A square face has a strong jaw line and a broad forehead, plus the width and length are in the same proportions. To make a square face look longer and to soften the angles, try narrow frame styles, frames that have more width than depth, and narrow ovals. Diamond-shaped faces are narrow at the eye line and jawline, and have broad cheekbones that may be high and dramatic. This is the rarest face shape. To highlight the eyes and soften the cheekbones, try frames that have detailing or distinctive brow lines, or try rimless frames or oval and cat-eye shapes. A round face has curved lines with the width and length in the same proportions and no angles. To make a round face appear thinner and longer, try angular narrow eyeglass frames to lengthen the face, a clear bridge that widens the eyes, and frames that are wider than they are deep, such as a rectangular shape. A base-down triangular face has a narrow forehead and widens at the cheek and chin areas. To add width and emphasize the narrow upper third of the face, try frames that are heavily accented with color and detailing on the top half or try cat-eye shapes. Now that we have discussed the basic face shapes, we need to look which colors suit your skin, eye and hair colors. The belief is that people are either cool (blue-based) or warm (yellow-based), and that everyone has their own color base. So your eyeglasses should complement your personal coloring. A cool complexion has blue or pink undertones, and a warm complexion has a “peaches and cream” or yellow cast. Olive skin is considered cool because it is a mixture of blue and yellow. Ready to find a pair of frames that look great on you? Contact us to set up an appointment, or walk in to look at all our different frames!